It is time we started listening to Ali. It is God’s plan. The analytical methods which postmodernism has given birth to are qualified by many sad features. One is the rejection of the idea of greatness. These methods leave no space for great men or women. What we find instead is an unrealistic leveling that reduces every prince to a valet and confers upon every valet princely pretensions. For example, Malcolm X, eulogized by Ossie Davis as a “black shining prince,” a man who had the courage to change when his commitment to the truth demanded change, as highlighted in his autobiography, is reduced to a conniving hustler who is constantly “reinventing” himself in Manning Marable’s deconstruction of his life. Being an old school person I have never been impressed with the new school. It is much too predictable and intellectually hegemonic. There must be ways of assessing reality that differ from the stark materialism bequeathed to us by the modern and now post-modern West. Islam provides us one of those alternative approaches, for more than any other system it demands that the Divine be considered in all things. It is through the prism of Islam, specifically through the unfolding of God’s plan, that I wish to examine some of the major aspects of the life of Muhammad Ali, may God have mercy on him. My contention is that Ali would never have become Ali had not God both prepared him for his times and prepared his times for him. That preparation began with Ali’s deeply religious mother, Odessa Lee Clay. His mother’s deep religiosity left an indelible imprint on the young Ali. That imprint would influence Ali becoming a dedicated member of the Nation of Islam (NOI) and a faithful follower of Elijah Muhammad. It would also sustain Ali once he moved away from the NOI under the leadership of Imam Warith Deen Muhammad, and later in his life as he became more deeply influenced by more traditional expressions of Islamic spirituality. Of course, it is highly possible for a child growing up without the influence of a devout parent to end up deeply religious, however, the odds are greatly enhanced when those closest to you during your formative years are themselves devout. In both his home and in church Ali was being prepared for a religious life. This is something all who knew Ali note. Like Moses, his being placed in a particular house was one of the first notable acts of Divine intervention in Ali’s life. Ali was also conditioned in childhood to make the kind of history-altering choices he would make later in life. He knew from a young age that there was danger in the path of a black man in America, hence, whatever decision you made you needed to be prepared to die for it. This sense of danger was drilled into Ali’s consciousness by the lynching of Emmitt Till. Ali would never forget that brutal Mississippi murder of a young man his own age. It informed him of the depths of hatred some men could sink to when you offended them, either via imagined or petty offenses, such as that attributed to Emmitt Till, or in highly charged ways, as Ali would later do. That being so, Ali knew that when you took a stand you had best be prepared to die for it. Hence, he was dead serious when he said, commenting on the hell he caught when he refused induction into the United States military, “Whatever the consequences may be, I will not renounce the religion of Islam. I’m ready to die. If you put me before a firing squad tomorrow, I’m ready to die.” Both that consciousness and courage were necessary gifts God gave to Ali. Ali’s boxing career itself began with what can only be described as an act of God. Of course, as Muslims we believe that everything is “an act of God,” I state it here for emphasis. That particular act was the theft of Ali’s brand new bike. Such an occurrence is common. I can remember my bike being stolen as a young boy, however, what happened next is extremely uncommon. First of all, Ali reported the theft to the police, something I never considered doing because the relationship between the police and those living in the vast public housing project I grew up in was such that you did not think of inviting the police to intervene in such matters. Young kids in our community were usually trying to avoid the police at all costs. Ali, however, went to the police and the officer he found, in segregated Louisville, Kentucky, happened to be a white boxing coach, Joe Martin, who had taken an interest in helping young black kids. Instead of blowing off the skinny twelve-year-old he suggested that he learn how to fight if indeed he wanted to punish the thief were he to find him. There are tremendous odds against this series of events occurring as they did. God had a plan for Ali and Ali was always aware of that fact. In preparing Ali for the world God blessed him not only with incredible physical ability, perhaps, during the earlier phase of his boxing career, he possessed the fastest hands in the history of the sport. He was also blessed with great physical beauty and a quick, poetic wit. There had been many talented boxers before Ali. We could mention in that regard one Ali himself idolized, Sugar Ray Robinson. However, none possessed Ali’s charisma and beauty– two attributes that would serve him greatly via the medium of television. In that regard, God brought Ali unto the national stage at a time when television was just emerging as a household standard and Ali was tailor-made for that particular medium. Whether bombastically threatening Sonny Liston, predicting the round in which his next opponent would fall, playing around with the Beatles, or bantering with Howard Cosell, Ali was the first athlete whose fame and/or notoriety was boosted to such an extent by television. A medium had been prepared for Ali which would be instrumental in projecting him unto the global stage. Like John Kennedy, whose improbable victory over Richard Nixon in the 1960 presidential election was attributed in large part to his televised persona, Ali’s rise, initially as Cassius Clay, was greatly enhanced by television. Had he appeared even five years earlier he would have been just a talented boxer little known outside of the fight world. Thereafter, God guided Ali to Islam. 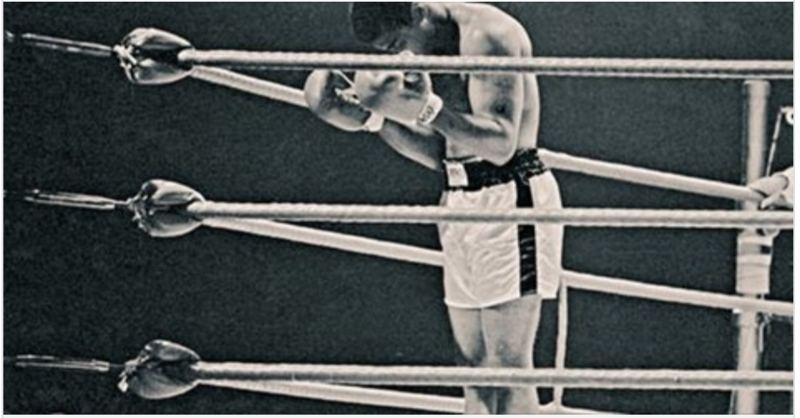 When one considers the likelihood of a brash, charismatic, highly successful athlete, with the prospect of making millions of dollars because of the aforementioned emergence of television and the tremendous revenues it opened up for top-level professional athletes (remember the picture of Ali sitting on a pile of cash), one must concede that Ali’s Islam itself is a miracle. God alone guided Ali to Islam and in so doing made him one of the most popular men on earth; for the entire Muslim world could relate to a boxing champion named Muhammad Ali. Ali became their champion. Had he remained Cassius Clay he would not have gained that degree of global recognition and popularity no matter how talented a fighter he was. Ali’s popularity was further enhanced when he took his stand against participating in the Viet Nam War. By refusing induction into the United States military Ali suffered the loss of his title, the loss of his livelihood and the constant threat of losing his very life. However, he would not back down. By so doing, he was facing, up close, the same forces that were ravaging not just Viet Nam but countless other countries in Asia, Africa and Latin America. In defying those forces Ali was now the champion of not just the Muslim world but the entire Third World. As he left the 1960s stripped of his title but steeped in his dignity, Ali was the most popular man on Earth. I have one bodyguard. He has no eyes, yet He sees. He has no ears, yet He hears. He remembers everything with the aid of mighty memory. When He wishes to create a thing He orders it into existence, but His order is not conveyed with words, which take a tongue to follow it or the sound carrying ears. He hears the secrets of those under quiet thought. Ask me, who is that? That’s God, Allah. He’s my bodyguard, He’s your bodyguard. Through his courage and defiant speech, Ali had captured the hearts of the struggling, oppressed Muslim and Third World masses. He commanded the global stage. Yet there was another audience God prepared Ali to capture, white America. Ali’s refusal to be inducted into the army occurred at a time when the movement to end the war in Viet Nam was just building up momentum. His courageous stand, taken as the heavyweight champion of the world instantly made Ali’s case the cause celebre of the antiwar movement. It also catapulted Ali, despite his involvement with the NOI, into the hearts of America’s rebellious white youths. As these youths, many of them attending elite universities, made their way into professional and public life, Ali would benefit in many tangible and intangible ways. Not all of white America was antiwar though. Not all of white America had been able to cleanse itself of the persistent stench of racism to an extent that would allow it to embrace such a fiery young black voice. The conquest of larger swaths of white America would come not through Ali’s words but through his silence. As Ali, once famously dubbed the “Louisville Lip” owing to his loquaciousness, lost his speech he began to speak with the tongue of his state. It was that tongue that was able to touch the hearts of millions of white Americans who, pitiably, were not prepared to listen to the young Ali, or Malcolm, or Dr. King, or Fannie Lou Hamer, or the angry black youth flooding the streets of Detroit, Newark, Watts, Hartford, Chicago, Washington DC and elsewhere throughout the nation. That silence allowed those who refused to listen to Ali or the masses he spoke for to finally hear him. God sent them a voice they could understand. That voice was a silent Ali. Contrary to what some may believe and have stated, that voice was not a passive voice of weakness, defeat and resignation. It was a powerful voice that roared through its dignity, love, compassion, perseverance, and its matchless affirmation of the ability of the human will to triumph over the most desperate circumstances. It roared in the presence of kings and presidents. It roared from the top of the Olympic stadium in Atlanta, Georgia. It roared, even after his passing, in Louisville, as Ali’s body wove through the streets of his childhood home en route to his final place of rest. It roars even today for those who care to listen. Finally, it was also God’s plan was to enter Ali, in my estimation, into a relationship with Himself of love, nearness and service, a relationship Muslims refer to as Wilaya. Ali was once asked by a young man in Ireland what he planned to do after boxing? Ali’s response was that he planned to use his remaining days to prepare to meet his Lord. God facilitated that preparation, among other ways, by taking Ali’s speech. The ensuing silence led to the contemplation, serenity, reflection, devotion and service necessary to cement Ali’s relationship of Wilaya with his Lord. Finally, just as God ordered Abraham to proclaim the pilgrimage among all nations of the world, promising him that He would ensure that every soul would hear his voice, He made sure that all of the nations of the world, even those who refused to listen, would hear Ali’s voice. It was always a voice calling to peace, and ultimately to love, mutual respect and goodwill towards all. As we stand today in a nation rife with polarizing hatreds, resurging racism, entrenching tribalisms and a debilitating refusal to listen to each other, it is time we started listening to Ali. It is God’s plan.